Look me in the eye and tell me you don’t procrastinate. If you can’t, you know why. If you can, you’re a liar and I still know you procrastinate. Whether it’s work, chores, or some miscellaneous task you need to stop putting off, procrastination is an addictive drug that is stopping you from getting where you need to go. Here’s what you need to do to beat it. Don’t touch your phone unless it rings. That means no scrolling, no mindlessly picking it up without intent, and no “checking to see if your phone vibrated” (no-one’s falling for that, by the way”). Put your phone somewhere that you can’t pick it up immediately, but you’ll still hear it on the off-chance you do get an urgent call or email. Not that you will. One way to get something done is to tell yourself, “For the next fifteen minutes, I can’t do anything other than this task”. 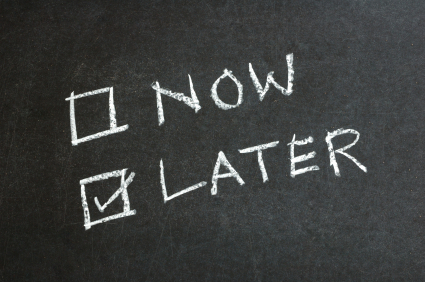 That way, when you feel the urge to procrastinate, you tell yourself you can do it in a few minutes. A lot of people like to use the Pomodoro Technique, where you work for twenty-five minutes and then chill out for five. This is particularly handy if you have a short attention span. This is another reason things like the Pomodoro Technique are helpful. It’s much easier to concentrate for twenty-five minutes than four hours. If you go into the library and tell yourself you’re going to study for eight hours straight, it isn’t going to happen. If you just focus on the next half hour, you can choose one small thing and actually get that done. Look at the next step, rather than the whole flight of stairs. You know how I feel about phones. But there are other distractions- any seasoned procrastinator knows you can find anything interesting if it means you don’t have to work. If you’re sitting in your room that needs clearing out, you’re going to end up playing your old Gameboy for four hours instead of doing anything. And no, the answer to this is not to procrastinate by clearing out your room, it’s to leave your room and find a better place to work. 6. Seriously, get rid of the phone! Your phone is not a study tool. Your phone is not helping you with work. Your phone does not have the ability to wash dishes. Put it down! You can mindlessly scroll when you’ve done whatever it is you need to do. It feels better without the guilt in the back of your mind, I swear. Few things in this world are more satisfying than ticking everything off a to-do list. Having a to-do list can clear your mind and help you to focus on your task, and ticking off each item will keep you motivated to keep going. It also makes everything more manageable- rather than floundering because your big task isn’t done, you can see that actually, you’ve made a lot of progress. You’re more likely to procrastinate when you feel like you aren’t able for your task- a to-do list can show you just how capable you really are. There’s a lot of stuff we need to do but don’t want to. Maybe it’s boring or hard or we just don’t care. Procrastinating doesn’t make that thing go away, it just makes you spend more of your life thinking about it. Whatever it is, just focus and you’ll get it done. And for God’s sake, put your phone away.